The 2018 CPW edition has passed. Thanks to all participants for joining us in Athens, Greece! The second 2018 bioinformatics and computational pathology summit (CPW) took place in conjunction with ECCB, the annual international computational biology / bioinformatics conference. The second CPW summit took place in Athens, Greece on Sunday, September 9, 2018. A pre-workshop dinner was organized at http://cookoovaya.gr/en/ Saturday, September 8. The final program from the 2018 edition is now available. Machine learning and Artificial Intelligence (AI) are everywhere, and digital (computational) pathology is no exception. As more and more pathologists begin to work with whole slide images (WSIs), they begin to understand that these digital data sets are full of unlocked potential. This workshop presents and frames these emerging technologies that will get pathologists and bioinformaticians alike up to speed. Digital pathology is increasingly used to study biological processes and diseases as novel molecular probing and imaging techniques allow the measurement of single molecules in whole tissue sections. Resulting multi-gigapixel images can be viewed on a computer screen via dedicated software. However, automated analysis of such large-scale datasets is challenging and their combination with omics data is not trivial. 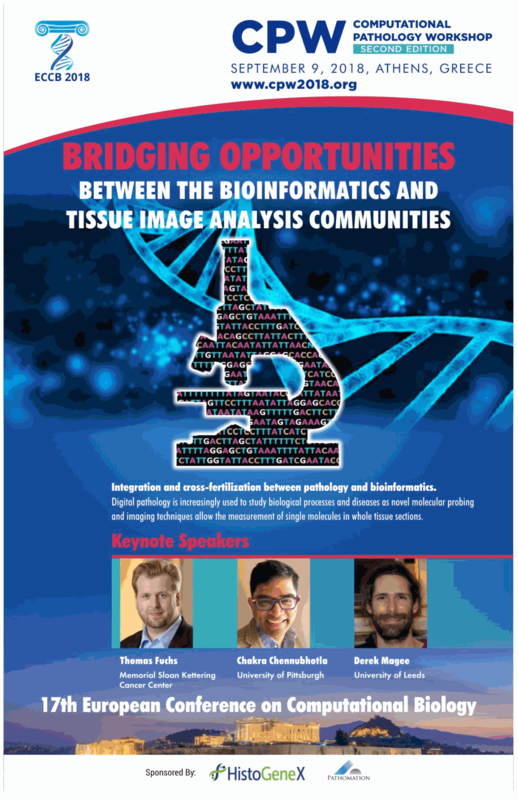 This workshop wants to facilitate bridging opportunities between the bioinformatics and tissue image analysis communities. Digital microscopy in its own right offers a new layer of data that can be added to and mixed with their current levels of *omics-datasets, and help them gain new insights into projects that they're already working on. See what went on at the 2018 edition. See what went on at the 2016 edition.